I wouldn’t really describe us as serious four-wheel drivers but we do like to get off – road whenever we can. 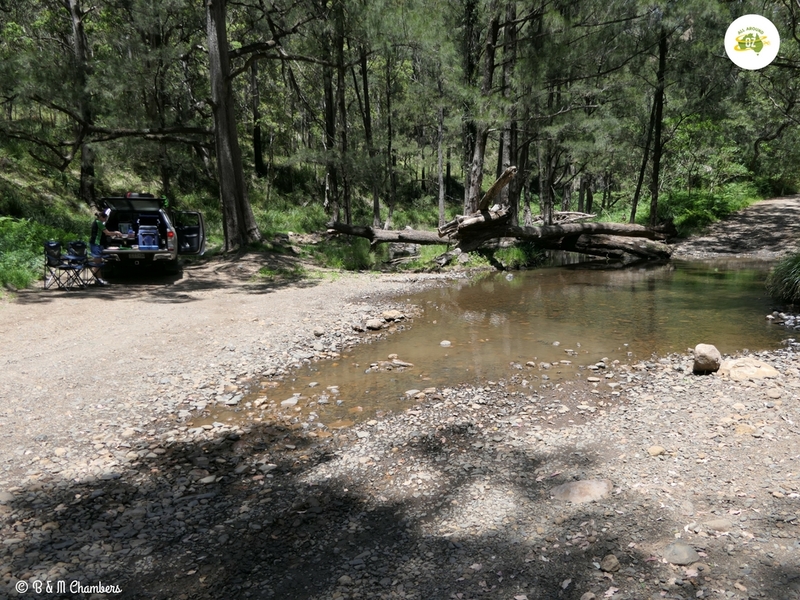 We recently had a couple of days to spare and decided to head to Queen Mary’s Falls so as we could drive the Condamine River 4WD track. This track runs alongside the Condamine River in the picturesque Cambanoora Gorge. It’s biggest appeal is without doubt the 14 river crossings you experience as you drive along the track. This sign marks the beginning of the Condamine River track. 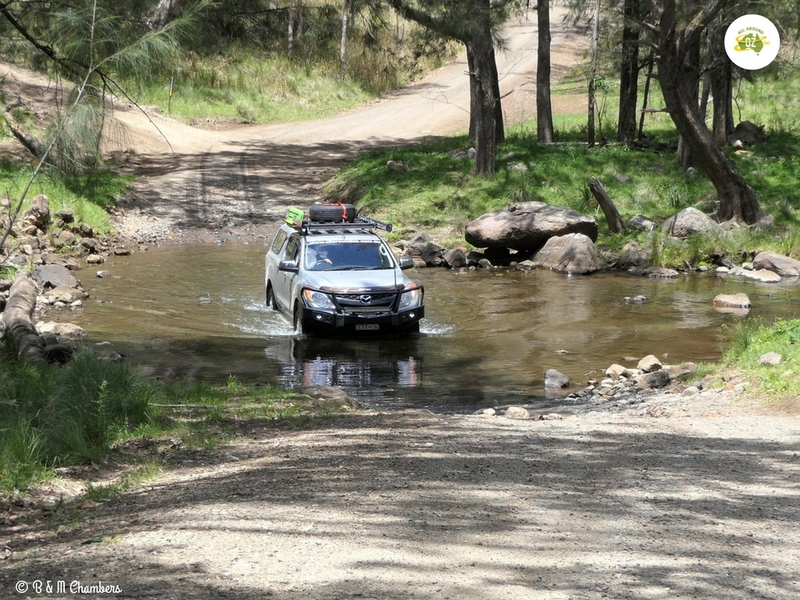 The Condamine River 4WD track is located in the Scenic Rim region of South East Queensland. It is about a two hour drive from Brisbane or the Gold Coast. You can drive the track from north to south or south to north. Or as it is not an overly long track, you can do both like we did! 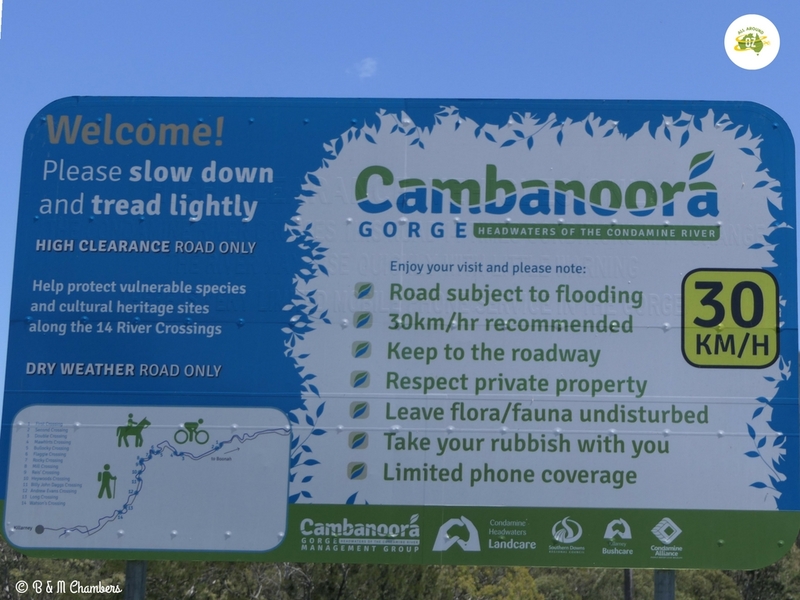 The Condamine River Road is about 20 kilometres long, and depending on road conditions and water levels should take you between 40 and 50 minutes to cover. It is recommended that you have a high-clearance four wheel drive vehicle to tackle this track in. The nearest town is Killarney, which is located a few k’s from the southern end of the track. All of the Condamine River Road is gravel, which is in excellent condition in most places, but there are a few spots that have wash-outs and large potholes. Some of these were full of murky water so be wary of those. The speed limit along the track is 30 kph, so this gives you an idea of what conditions can be like. Our first water crossing was Watson’s Crossing and it is actually a concrete causeway. It had a small amount of water flowing over it so wasn’t a problem. The second crossing, known as Long Crossing, was a bit of a different story. It was, as it’s name suggests a lot longer than the first one and had a rough, rocky bottom that required a little bit of care whilst crossing. This was one of the deeper crossings with the water coming up to the side steps on the BT. 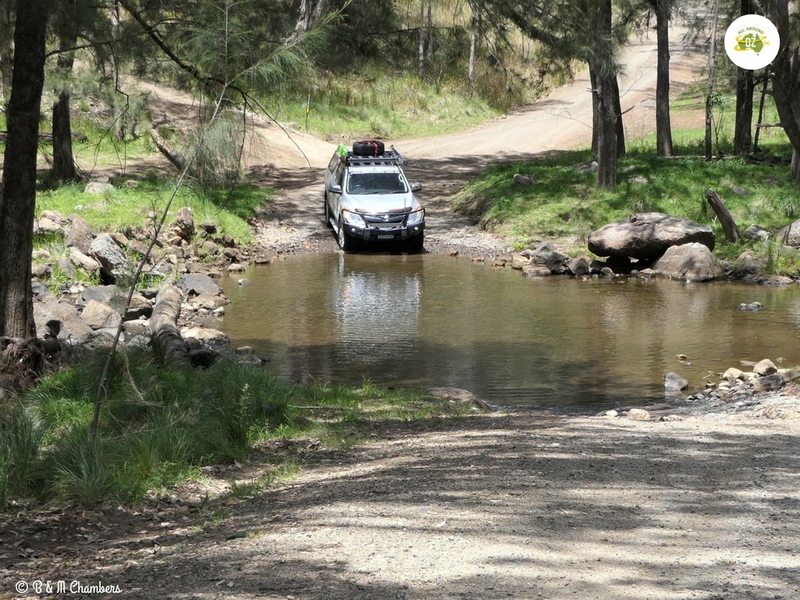 The one thing about all the crossings along the Condamine River track was that the water was really clear, so we could easily see what we were about to drive over. The Condamine River Road runs through lots of private property. Most of this is fenced off or clearly sign-posted. But there are a few lovely shady spots to pull up for some lunch or even a quick swim. We pulled off the track just on the northern side of First Crossing for lunch. It was so quiet and peaceful and we only saw a couple of other vehicles. There are plenty of other spots to stop and take a few pics along the way as well. We found a lovely shady spot near First Crossing to have lunch. Once we had finished lunch, it was my turn to have a drive. We both think it’s really important for anyone travelling to have someone else that can drive and tow in any conditions. I couldn’t wait to jump in and have a go at the track myself and with a little guidance from Brenden I had no problems navigating the crossings. The main thing I learnt was to stop for a few moments and assess the crossing before continuing through. Look for large rocks or deep holes. Also look at the other side of the crossing to determine the best way to come out of the water. 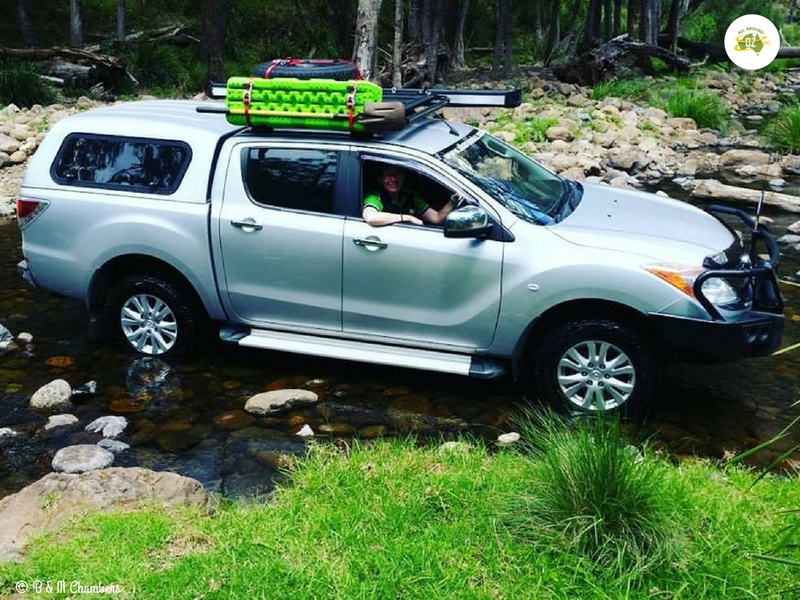 I had an absolute blast driving the Condamine River 4WD track. We had an absolute blast driving this track. If you haven’t had a lot of experience driving on rough roads or with water crossings I would highly recommend this track as a starting point. We are planning another trip soon, but this time taking the kids to give them some experience in different conditions. We chose to stay at the Queen Mary Falls Caravan Park (blog post to follow) but there is also accommodation available in Killarney or Boonah. If you want to see what the track is really like before venturing out that way, you can check out this video we put together. Any of the National Parks offices out that way have maps. It’s well sign posted from both ends so not hard to find. Google maps also shows it clearly as well.